You can start exercising your puppy from an early age, for short periods, and work upwards from there. We have some specific information on how much to exercise in our article Exercising a Siberian Husky Puppy. You can and should start walking from an early age. 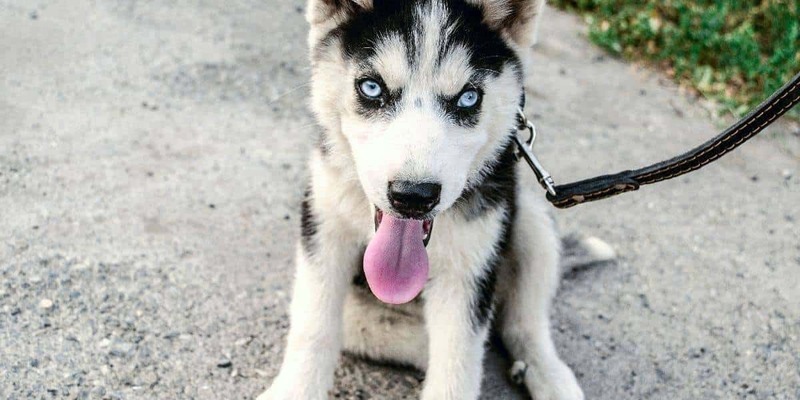 Eight weeks is ideal, or whenever your Husky has been given its vaccinations, both of which should approximate when you pick your puppy up from the breeder. Some trainers suggest a leash is best because it gives stronger physical feedback to the dog if they pull – i.e. a choke. Others suggest a harness for that very reason – it is more gentle while still achieving the primary objective, which is to keep the animal restrained. Whichever you go with you start with short walks while your puppy is small and still building muscles. Over the first year you can gradually build up to longer (1 hour) exercise sessions. If you have aspirations to have your Husky pull a load (sled, sulky, or yourself on rollerblades, a bike or scooter) then a harness is the way to go. Even though you won’t have your puppy pulling loads early on, it can get used to the sensation of having a harness around it’s chest. There are plenty of harnesses on the market to choose from. Find an open area free of human and animal distractions, and keep your Husky on leash at all times. Huskies have an inherint desire to take off and run – and if given the chance – probably will! Patience is the key to effective training. You need to take your time and give plenty of positive feedback to encourage effective behavior. Walk slowly. Your dog will probably want to run in all directions. If any of those directions is not forward, stop and let the dog pull on the lead until he or she figures out they aren’t going anywhere. Work up to walking for a dozen or two yards then stopping. Give postive feedback in the way of praise, cuddles, and maybe a food treat. Repeat until your dog gets used to the idea of walking in straight lines, reducing the food treats but keeping up non-food appraisal to encourage this behavior. Work up to longer walking lengths as your puppy grows in confidence, ability, and endurance. If you feel the puppy has the strength you can try some running for short bursts, evaluating how it feels afterwards. If overheating or exhaustion seems imminent then, of course, take it easy and try again another time. If your dog doesn’t want to move, then walk alongside it. Try holding a small food treat at nose height to encourage moving forward. Some puppies want to move, some don’t and it will take time to learn this behavior. Just be patient and don’t stess if it takes a few weeks or months for the dog to get its confidence up! Lots of positive feedback will help. In your training you will probably notice your puppy getting over-excited at times. You should look for the warning signs leading up to this behavior, such as howling or barking, a change in movement, a desire to jump or run. When you see this behavior coming up you know to pull the leash back in a bit and slow down. You want to make sure you are in control and that your puppy knows it. There is no need to penalise the puppy with negative feedback. Just stop and be quiet until your puppy settles down. Ready for more? Check out Pull Training for Siberian Husky Puppies if you want to start pulling a sled, a cart, or yourself! Having trouble with an over-excited Husky? We have some tips for leash pulling problems here.